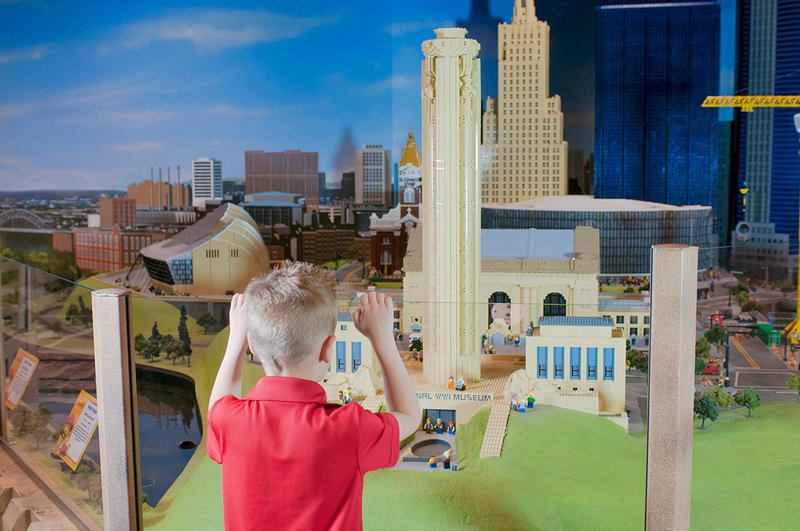 LEGOLAND® Discovery Center Kansas City is a LEGO-lover’s paradise designed with 4- to 12-year-olds in mind. Bright-hued LEGOs abound, from boxed sets to a wall display with blocks in every color of the rainbow, with activities including a miniature carousel, a replica of KC’s cityscape and an interactive 4-D cinema. But this summer, many guests are visiting specifically to explore Crown Center’s new LEGOLAND Train Station Adventure. The $1-million permanent exhibit reenergizes existing LEGOLAND space and refreshes the Discovery Center’s overall appearance. “It’s great to have this exhibit available in our peak season,” said Jade Sparks, marketing manager. The new Train Station Adventure pairs color and creativity with a wide variety of kid-friendly activities, including the first exhibit visitors encounter upon entry: a 15-foot LEGO build table. The activity depicts a brightly lit urban skyscraper and neighborhood, as well as a farm that features a barn and silo amid deep green LEGO “fields.” Anchoring opposite ends of the table, these sites are linked by a continuous track on which kids can move trains by hand. That said, the centerpiece of LEGOLAND Train Station Adventure is a two-story play space, constructed from giant, decorative LEGOs and featuring a massive, multi-hued train engine. From a conductor’s chair inside the area, kids can view local landmarks as they pilot the train via an interactive computer game. There’s even a model streetcar on the same level that looks out over the entire attraction. Two slides connect top and bottom levels of the structure and emit train noises as children travel down either chute. Kids giggle while entering and exiting the structure through an enormous, well-lit “rolly bin” at the bottom, reminiscent of a giant hamster wheel. Young ones can make their way through a Wiggle Waggle Maze—a “spider web” where kids maneuver and balance as they travel through the area by gripping urethane coated chains—navigate curved Wave Boards or try out a bright-colored Sit and Spin. Anchored to the floor, older kids can bounce on a giant Pogo Stick while a toddler area offers several activities on a smaller scale. Overall, the Train Station features more than 10 new interactive experiences. A long and comfortable banquette provides adults with great views of their children at play, with a wall-spanning mural that depicts a train depot waiting room positioned just above. Another nearby mural features a map of the Kansas City area and highlights the Crown Center/Union Station neighborhood. 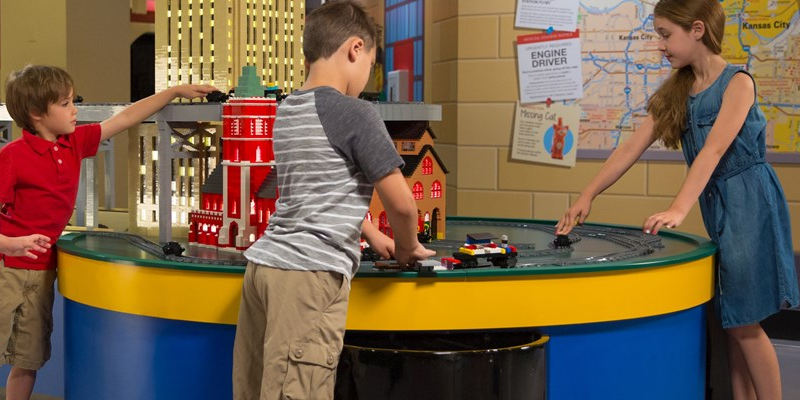 Located at Crown Center, 2475 Grand Blvd., LEGOLAND Discovery Center Kansas City is one of eight additional LEGOLAND Discovery Center sites in the United States. Visit LEGOLAND’s website for more information and to purchase tickets.